This album is the dream that keeps on giving. It is mainly the work of trumpeter Jon Hassell, a student of both Karlheinz Stockhausen and Pandit Pran Nath. 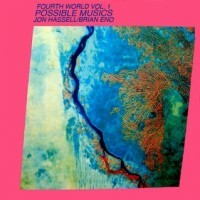 On this LP, Hassell pioneered a unique brand of ambient, subliminally rhythmic music he dubbed “Fourth World.” Brian Eno added his discreet production touches and conceptual suggestions, but it’s Hassell who stirs the sound into its timeless placelessness. Attentive listeners will notice Fourth World Vol. 1: Possible Musics‘ influence on Eno and David Byrne’s My Life In The Bush Of Ghosts, which came out a year later. Throughout Fourth World Vol. 1, Hassell makes his trumpet utter exotic avian and animalistic cries, sighs, and murmurs; it really is like nothing else I’ve ever heard. The five tracks on the first side—“Chemistry,” “Delta Rain Dream,” “Griot (Over ‘Contagious Magic’),” “Ba Benzélé,” “Rising Thermal”—could be Plutonian jazz or ritual music for a prehistoric race… or for accompanying whatever ceremonies humans will hold in the 31st-century. These tracks are at once unsettling and calming, alien and poignant. They make you feel bizarre emotions that seem outside of human experience. “Delta Rain Dream” is the zenith of the LP’s hazy oneiric drift, with Nana Vasconcelos and Ayibe Dieng’s congas enhancing that feeling by tumbling in an uncannily off-kilter cadence. The sidelong “Charm (Over ‘Burundi Cloud’)”—bear with me here—could’ve soundtracked those slow row-boat rides in Apocalypse Now… if the film had swapped out its hellish milieu for a heavenly one. The trance-inducing “Charm” is the perfect finale to an album that gently launches you out of reality into an imaginary environment that only a genius of Hassell’s caliber can conjure.